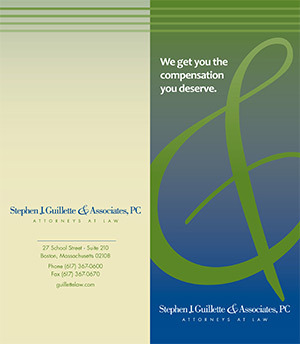 Your Legal Rights – Stephen Guillette & Associates P.C. Massachusetts’ law permits “recovery” for damages suffered as a result of injuries sustained in car accidents. The term “damages” refers to physical injuries, death, pain and suffering, and economic losses such as medical bills and loss of income. Generally, Massachusetts’ law allows a person to sue for pain and suffering if their medical expenses related to the accident are more than $2,000.00. Medical expenses include hospital bills, doctor’s bills, bills for x-rays and other tests, such as Magnetic Resonance Imaging (MRI). Also included in this category are ambulance bills, prescriptions, bills for physical therapy and chiropractic care. Massachusetts’ law also permits a person to sue for injuries if he or she suffers a permanent injury or a broken bone, regardless of the amount of his or her medical bills. If someone dies from injuries caused by a car accident, his or her “estate” can sue, regardless of the amount of medical expenses. How Do My Bills Get Paid? Generally, your medical bills are paid by the insurance company that insures the car that you were in. If you were injured as a pedestrian, the insurer for the car that hit you is required to pay. The insurer must consider any “reasonable and necessary” medical expenses that are “causally related” to the accident. If a medical professional determines that you are unable to work as a result of your injuries, the auto insurer for the car that you were occupying will pay 75% of your gross weekly wage for your period of disability. Since the disability must be ”medically necessary” you must have a disability note from a medical professional in order to be paid for your time out of work. Generally, the responsible party –or their insurance company –must pay for the property damage to your vehicle. If you had “collision” coverage on your vehicle, you insurance company will pay for the damage to your car. If you did not have collision coverage, the responsible party’s insurance should pay for the damage to your car if it is determined that you were not at fault for the accident. Am I Entitled To A Rental? Under most circumstances, the responsible party’s insurer will pay “reasonable rental” charges if you were not at fault for the accident. On the other hand, if you purchased optional “substitute transportation” coverage on your auto policy, your insurance will pay reasonable rental fees, regardless or fault.